At our office, our experience in helping people have allowed us to clearly see there really is no luck or “lottery effect” to weight loss or healthy weight management. There’s a simple truth at work: Your decisions today determine your actions … and your actions today produce your results of tomorrow. We can’t take short cuts today and hope to end up on the “road to health” later on. We can’t slack off today and expect to reap our desired results for weight loss and health down the road. We can’t “cheat the system” (science, research and proven results) today and not expect to pay the price later. It’s fascinating, but we really can DECIDE what to aim at in life … and who to BE in life … and how to LIVE life … and how to EAT … and more! In fact, it’s been said that our greatest power is the power to CHOOSE! Our challenge for you today is to stay “in the moment”. Live consciously. Decide today to be the best YOU possible! Stop delaying decisions. Think about the future – not just about the short term. It’s also been said … Some people make the future. Most wait for the future to make them. The future is yours to design! The CHOICE is simple: Will you be a future maker …or will you allow the results of the future (obesity, diagnoses, etc.) to make you? Our day-to-day focus is to help individuals make good choices in reaching and maintaining their healthy weight and state of living. Our goal is very simple…to take massive action towards the over-weight and obesity epidemic that is leading to metabolic syndrome and more illness and disease than any time in history. 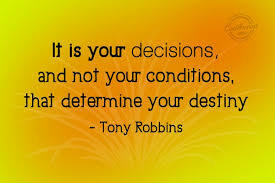 And that starts with DECISIONS! If you haven’t done so already, take some time to contact us and learn more! It’s a great time to DECIDE on HEALTH!